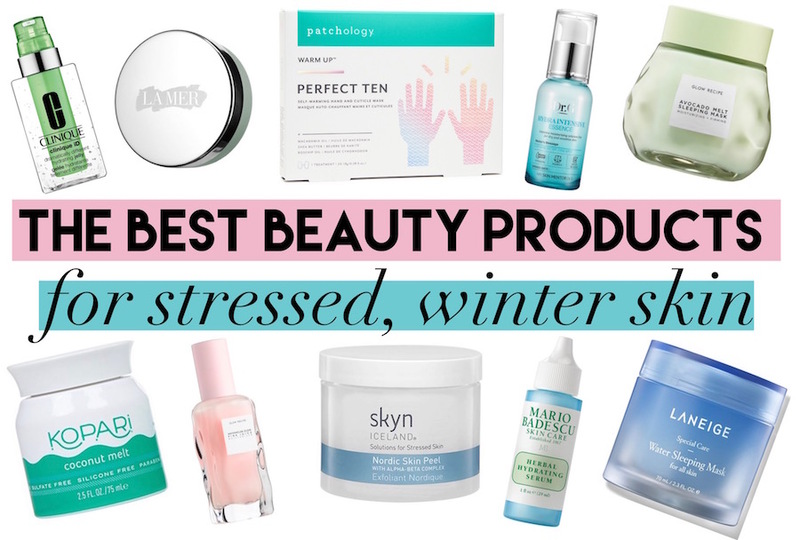 It’s no secret that winter is tough on our skin. The cold, dry air takes such a toll on my skin that it actually starts to (painfully) crack and peel if I don’t take proper care of it. The best way to save your skin in the winter? 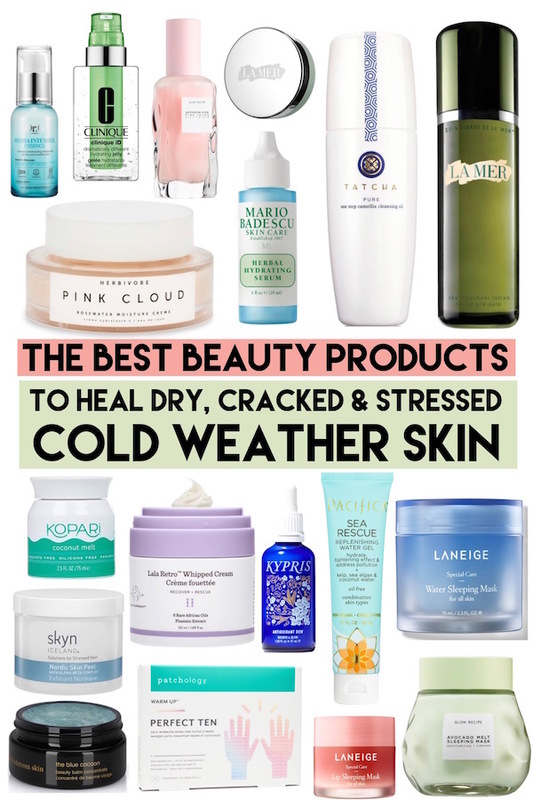 Why with the best beauty products for winter, of course! With the exception of a two-winter stint in Miami (which is great on the skin, by the way) I’ve been doing the leg work on this article for upwards of 15 years. I’ve had to research first-hand, through trial and error, the best beauty products to save my skin in the winter. My friend Haley put me onto this awesome lip sleeping mask that comes in either berry or vanilla flavor (I opted for the berry!) and with hyaluronic acid, minerals, vitamin C and antioxidants – a heaping layer of this mask before bed helps to reduce the flaky, cracked, dry lips that winter can sometimes produce and leaves you with soft, supple and refreshed lips when you wake up. Many of the best moisturizers are overnight products that work their magic while you sleep. This avocado sleep mask is pretty thick and creamy and with avocado that hydrates and supports natural collagen, manuka honey with soothing antioxidants that relieve stressed skin, and kaolin clay that absorbs excess oils and decongests pores – this mask is packed with everything you need to heal dull winter skin. The best part? It’s also free of sulfates, parabens, phthalates, oxybenzone, and has less than 1% of synthetic fragrances and is cruelty free! This is called a “lotion” but to me the consistency is more of a light serum or a liquid primer. But, regardless, This ‘The Treatment Lotion’ is the perfect post toning first step to prep your skin for a serum and moisturizers. It’s rich and silky and instantly visibly awakens the complexion and drives moisture deep – making it the perfect first step in your winter skin care routine. I like to use this product both under my nightly moisturizers and also under my primer/concealer and makeup. There’s face oils and then there’s this Skyn Arctic Face Oil that is derived from Iceland – where they know tough winters. Surprisingly lightweight for such a hydrating oil – this blend of camelina oil, vitamin E and sunflower oil help with skins elasticity, natural antioxidants and anti-inflammatories. Skin peel? Jackie, what? I thought this is about moisutirzers and oils? Well, hear me out. Exhausted, dry, flaky skin can’t absorb all the nutrients, oils, and treatments you’re applying. Enter these Nordic Skin Peel pads which is surprisingly gentle for being so effective. The pads exfoliate to reveal fresh, healthy skin and also clean up dirt and oil – making your pores nice and clean. A boost of emollients and antioxidants improve tone and texture while tackling fine lines. Another Glow Recipe product, like the avocado sleep mask, this watermelon moisturizer is one of my favorites and even made its way onto my Best Gifts for the Beauty Obsessed Traveler list! I like to use this almost as a serum for my forehead and cheeks before applying moisturizer and I notice an immediate result when applying this very light moisturizer. I was introduced to this lightweight powerful rosewater moisturizer while on a press trip in Canada, in the winter. The fact that it left such an impression after that trip that I went home and bought it is pretty much endorsement enough. On the off-chance you need a harder sale – this product received a “clean @ Sephora” badge and Herbivore products are all vegan and cruelty free and are also free of synthetic ingredients. Anyone with normal, dry or sensitive skin can rejoice with this Hydra Intensive Essence that’s formulated to keep your skin balanced and healthy inside and out. Not only can you expect your dry, tired skin to have a revitalized boost – it also enhances your skins protection against environmental stressors, making it a perfect post-toning step for those frigid, dry winter days. When it comes to winter skin – you need to hydrate during every step of your skincare process. Skip the moisture sucking soap and opt to use this moisturizing oil cleanser instead. I love to use an oil cleanser as the first step of my nightly skincare routine to remove my makeup, any dirt or oil buildup from the day. I follow up my oil cleansing with a light exfoliant like this glow ultra-fine exfoliating powder. Finding a great oil-free serum can sometimes be difficult but this herbal hydrating serum comes jam packed with gingko and ginseng to not only hydrate but also soften and invigorate the skin making it a great addition to any winter skincare routine for dewy, glowing skin. This moisturizer and concentrate system is perfect for everyone because you choose a cartridge based off of your skin type (very dry to dry skin, combination to oily skin or a jelly for all skin types) and blend the concentrate on your own giving you a freshly blended product with optimized performance for every use. I love a good overnight hydrating mask and this water sleeping mask is everything I love about them. It goes on fairly thick but doesn’t grease out my face and I wake up feeling refreshed and hydrated. Any moisturizer that’s ‘whipped’ automatically wins in my opinion. And this Drunk Elephant Lala Retro Whipped Cream is whipped with an ‘airy blend’ of six rare African oils blended with antioxidant rich fermented green tea which means it not only hydrates but also assists in combating signs of aging and according to Sephora “is a silky, dream come true for tired, dehydrated, dry skin” making it the perfect moisturizer for stressed winter skin. I love a good gel-type of moisturizer and this sea rescue replenishing gel represents everything I love about them. Coined as “your solution to skin pollution” this oil-free gel is jam packed with nutrients from plants from the sea (think: kelp, algae and spirulina) and is backed up with the power of coconut water and aloe vera. It immediately feels soothing when you rub it onto your face and creates a tightening effect on the skin. I was first introduced to bio-oil as an oil to help with scarring nearly 20 years ago when I cut open my eyebrow and had to get stitches on my face. This bio oil is called a ‘multi-use skincare oil’ because it legit has multiple uses. It’s fortified with different oils from lavender to rosemary to sunflower oils, packed with anti-aging properties, as well, and assists with winters dehydrated skin. It can also be great for stretch marks and uneven skin tone and is a perfect addition to any bathtub! With 26 active, natural ingredients this Antioxidant Dew is perfect to restore not only moisture to the skin but also reinvigorates skin with soothing and glowing properties while enhancing elasticity. The burst of hydration can assist with calming the appearance of redness (a must have in a beauty product for suffering winter skin). My friends at Patchology sent me a few of these perfect 10 Hand and Cuticle Masks to combat the harsh winter months and the toll they take on your hands and cuticles. You place your hands in the sachet and let the coconut infused formula instantly moisturize your hands and with a blend of macadamia oils and shea butter – the mask not only supports healthy cells but also improves skin’s elasticity while working to reduce appearance of scars! Does your sad, tired, stressed winter skin give you anxiety? If so, this blue cocoon beauty balm is just what you need. The ‘balmy blue enchantress’ brings a cool serenity to the skin and melts to the touch that ‘tenderly envelopes you in the most decadent azule calm”. Not only does the Blue Cocoon assist with reducing redness and help with angry, dry skin but the product is said to reduce emotional anxiety; leaving the mind clear and tranquil. No winter skincare list would be complete without the inclusion of coconut oil. This coconut melt from Kopari is great because it’s everything you know and love about moisturizing, soothing coconut oil and can be used to help treat dry skin (from body to face) as well as a hair mask and even as shaving oil. The added bonus of Kopari products are that they’re all made with 100% pure, organic coconut oil. Whether your winter skin goals include ultimate hydration, reducing redness or simply relieving your skin of stress – you’re sure to find something on this list to heal your winter skin woes. 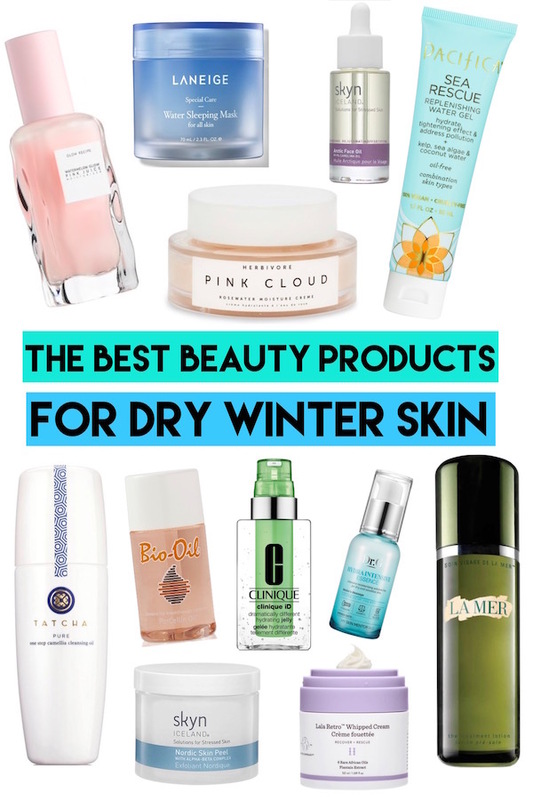 Do you *love* a particular product for during winter that you don’t see here? Feel free to share below!